Succumbing to pressure from San Luis Obispo County Supervisor Bruce Gibson, the California Geological Survey has demoted a state geologist who is critical of the science behind a contested local air pollution regulation. The demotion has prompted feuding among county officials. In June, Will Harris, a senior engineering geologist, spoke during public comment at an Air Pollution Control District (APCD) board meeting in which he argued the district’s Oceano Dunes dust rule is pointless. 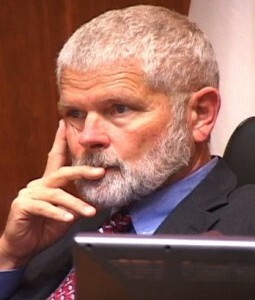 During the meeting, County Supervisor Adam Hill threatened Harris’s job. Three days later, Gibson followed up the threat in a letter to California’s chief geologist. Now, Harris has lost his office and is working in a school safety position. He was moved to an office on a lower floor of his work building. In a farewell letter to colleagues who worked with him on off-road vehicle parks, Harris wrote the Geological Survey removed him from the position because of his comments at the June San Luis Obispo County APCD meeting. In the letter, Harris said that Gibson complained to his bosses. Don Drysdale, an information officer with the Department of Conservation, confirmed with CalCoastNews that Gibson contacted chief geologist John Parrish about Harris. Drysdale said the conservation department does not consider Harris’s change in role to be a demotion. Rather, it is a reassignment, Drysdale said. The APCD dust rule is based on a contested study that concluded off-road activity on the dunes has caused an increase in pollution on the Nipomo Mesa. The rule requires state parks to reduce the amount of particulate matter blowing from the off-road vehicle area to natural background levels or face fines of $1,000 per day. At the June meeting, Harris said natural background levels of dust are actually higher than the current levels because state parks has planted vegetation in the area. Harris has since distributed aerial images comparing the dunes in the 1930s to the dunes in 2014. The 1930s image displays more sand than the 2014 picture, and the recent image shows that much of what used to be open sand is now covered with vegetation. One of the areas with considerable vegetation is the location the APCD selected as its control for air quality readings. To test whether the dust blowing from the off-road area of the dunes is exceeding “natural background levels,” the APCD set up a monitoring station downwind of the riding area and a monitoring site downwind of a control location that is further south and is not used for off-roading. The APCD could levy fines against state parks on days in which there is more pollution at the location downwind of the riding area than at the control site. The APCD is currently facing an approximately $300,000 funding shortfall because of lost fees from the shutdown of the Morro Bay power plant. In a memo to state parks, Harris wrote the APCD set up the monitoring sites in a way that skews the results so that more violations of the dust rule occur. For instance, the control site is an area with more vegetation and less wind, Harris states. On Wednesday, the APCD board met for the first time since June. During the meeting, Gibson and Hill chastised other board members who defended Harris and questioned the science of the dust rule. During approval of the minutes, County Supervisor Debbie Arnold made a motion calling for the minutes of the June meeting to state that Harris was interrupted during his public comment. Hill responded by saying the board could say anything in the minutes. “We can say a dolphin walked down the aisle,” Hill said. Paso Robles Councilman John Hamon, who is currently running for District 1 county supervisor, said he was embarrassed by how fellow board members handled the exchange with Harris at the June meeting. Ultimately, the board voted 6-5 in support of Arnold’s motion. A short time later, Supervisor Lynn Compton also questioned the science behind the dust rule. Compton asked why the APCD is comparing air samplings from a location that is a sheet of sand to a control location that is heavily vegetated. Gibson responded by saying the best technical minds of the APCD, state parks and state Air Resources Board agreed on the control site. He then called Compton close-minded. The APCD website lists five engineers who work on local air quality monitoring issues. Of those, none are licensed professional engineers, according to the California Department of Consumer Affairs. Gibson truly only cares about himself. He destroyed two families with his sneak around antics, and now he’s destroyed someone’s career. And for what? Satisfying his own ego. Gibson and Hill are an embarrassment to county politics. Both need to be removed from office! I am sick and tired of their bully antics and criminal behavior. Will the future of public comments be a screened black and white sihouette with a disguised voice so that the anonymous presenter will be guaranteed that no retaliatory action will take place? Gibson got him demoted. Next he’ll go after his wife. Don’t mess with Bruce! I would like to thank Mr Harris for the courage to share his professional expertise. Given the current government climate, there is always a small chance this can come back on a worker. Even though the information was factual and mundane, it did not fit with Mr. Gibson’s agenda. This, he abused his position to influence others to effect Mr Harris’ livelihood. Mr. Gibson is basically a thug in a suit. Yeah, I said it. Better call my boss…..
After looking at his email and memo, it seems to me Harris makes a pretty simple, straightforward point: That the “natural background” claim by the APCD is a false. His photo comparison of the south dune area shows that clearly enough. So why was his concern shut down so forcefully? Gibson claimed Harris’s “technical credibility is pretty well shot.” How? Because Gibson intimidated Harris’s employer to demote him? That only tells me Gibson was afraid of what Harris was saying and chose instead to attack the geologist-messenger. As a member of the public, I resent that Gibson and Hill prevented an airing of Harris’s concern–I for one would like to hear the APCD try to defend their “natural background” claims. What’s more, it sickens me that Gibson resorted to career-destroying tactics to shut down discussion. Mr. Gibson. You will stand before the Great White Throne Judgement, before our Holy God, to give an account of the evil you have perpetrated against others during your lifetime. However, you still have an opportunity while you still breathe, to ask our Lord and Savior Jesus into your life. He stands at the door of your heart and knocks. Won’t you consider that today sir? Eternal life is forever. Wouldn’t you rather spend it with Him as oppsoed to where you seem to be headed at this point? I would not bet against the people that believe that Mr.Gibson will be hanging a framed copy of this picture and headline in his office. To encourage the truthful (sic) opinion of others.